My legs felt a little heavy after yesterday’s six hour training ride. It took some time to warm up. I was quite hungry on today’s ride and pulled over a couple of times to get some solid foods in me. The training goals and actuals are almost exactly what they were yesterday so I won’t load any additional graphs. One awesome thing that happen today was running into Isabelle Drake. I was experiencing a lull in my ride, just south of San Clemente, when up ahead I saw a Furnace Creek 508 vest. I wondered who that might be. As I got closer I recognized Isabelle. The timing was perfect. I snapped out of it and started riding better. She has a knack for that! At the 2009 Furnace Creek 508 the winds were gusting up to 60 mph and we motivated each other to keep riding as we played leap-frog through Death Valley. Thank you Isabelle you did it again you got me through a rough patch. When I post my Death Valley Double Race Report this is the Isabelle that I will talk about. You made my day today. I was so excited to see you. It’s been a long time. Once again congrats on your incredible ride on the Death Valley Double Century this year with only 10 finishers. I think that may be a record low statistically on any double. You have inspired me today for my training for RAAM! Hope we run into each other again out there soon. It’s always a pleasure to visit with you. I just realized that today was the first time we’ve ridden “together”! Let’s not make it our last! George have you written something about what you use to record your rides and provide the maps and data? I have posted from time to time where I get my data but it’s scattered amongst many posts and comments. Here you go! My primary means of collecting data is I use an SRM Power Meter it is a wireless crankset power meter that sends a signal via Ant+ to the PowerControl 7 – the dedicated head unit for SRM. If you are not familiar with SRM it is the industry standard for power meters. So the power data and more comes from the SRM. For blogging purposes I use a Garmin 310XT. 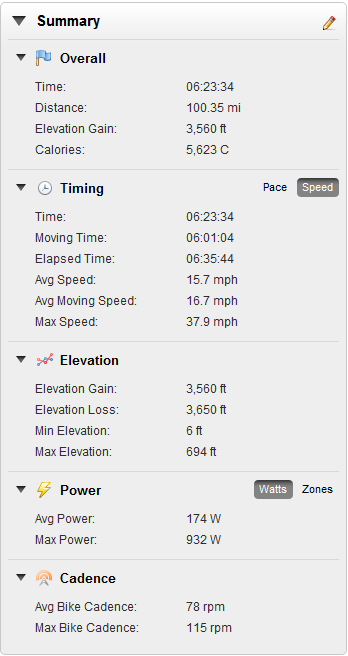 The Garmin allows me to show the map plot of where I did my activity and provides a more blog friendly summary. I hope that helps if you need additional clarification please feel free to comment again. Please pass my blog along to your friends.